The Laundry Closet has to be one of the hardest spaces in the house to organise don't you agree? You have all matter of items to organise from sheets to towels to blankets and even toiletries thrown in for good measure. The laundry has a tendency in most households to be a teeny bit messy because we don't traditionally spend enough time in here to warrant getting it all organised. But putting in place a system of organisation can most definitely save you time (and stress) in the long run - trust me on that!! I have used the Home Storage & Living Linear Baskets that I purchased back when I was setting up my nursery. I love this basket style, they not only look great but are durable and the perfect size for laundry organisation. Prior to implementing the baskets, I had everything folded neatly, but even when it was neat it still looked 'messy' to me as I find that sheets (particularly the fitted variety) are so hard to keep looking nice on the shelf. 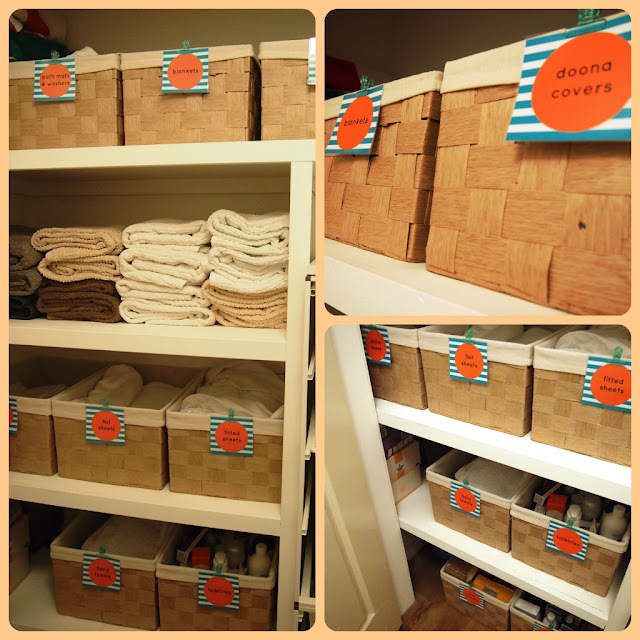 I have used baskets for organising almost everything apart from my towel collection. I decided just to keep my towels folded on the middle shelf so that I could fit more in, at the moment this is working fine. I really love my current system, by giving everything a place it has made it super easy to maintain the organisation system and keep it looking neat and tidy. If your laundry cupboards could do with a bit of love, here are a few of my tips for creating an organised laundry that is easy to maintain (yes really!). The baskets are truly a super easy way to keep things neat and organised. 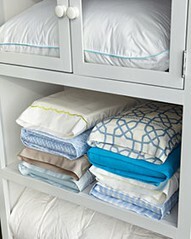 I used to find with sheets and towels that they were hard to fold and the piles would never stay neat and orderly. I don't have this issue now with the baskets as they keep items 'partioned' and in groups. I have labelled my baskets using the labels that I created - which are very basic - I am definitely no graphic designer. I love to label things because this creates a 'home' for items and therefore it is easy to maintain the organisation that you have put in place, as you always know where things go. If you are fortunate enought to have your husband or kids help you out with the washing, then labelling will avoid any confusion as to where the towels live etc. If you would like to use my labels in your home, then I can look at uploading for your printing pleasure, just let me know! Keep the items that you use most frequently in the most accessible position in your cupboard. For my family, I keep the towels and the sheets in the most accessible position because these are the items we reach for most often. 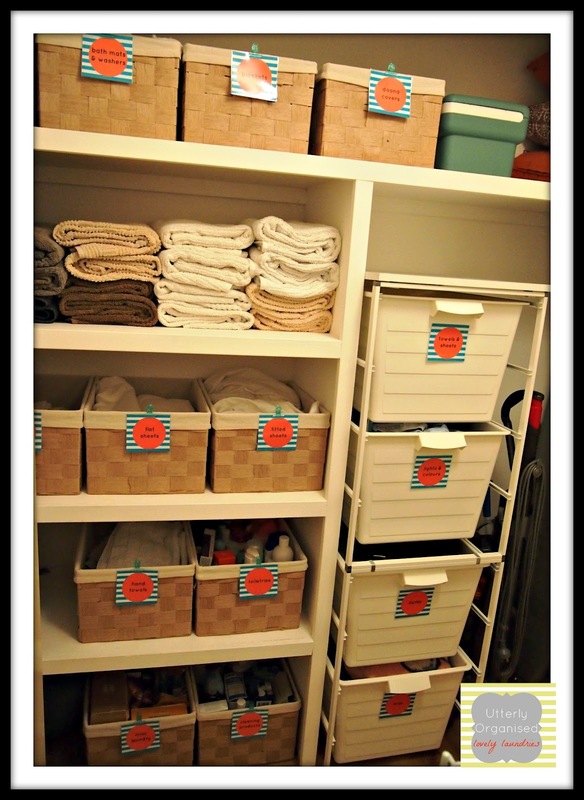 Store seasonal or your occasional items at the bottom or at the top of your laundry cupboards. I have our beach towels, spare doona covers and large blankets at the top of the closet as they are only used seasonally. Instead of taking up valuable space in our laundry closet, I store the bulky items such as our spare doona insert and pillows in vacuum sealed bags in our garage. If you have items like this taking up valuable space in your closet then consider the use of vaccum sealed bags - they are amazing space savers. Towels can be the most space consuming of all items in the laundry cupboard as we seem to have so many of them! The trick is finding a way to store these neatly whilst maximising space. I prefer to fold my towels in thirds length ways to get maximum space, but rolling towels also looks lovely (think day spa or resort) and is very space friendly too. Sheets are definitely also another troublesome area for the laundry cupboard - does anyone else struggle to get a fitted sheet folded neatly and flat?! Well you are definitely not alone. The basket is great for keeping these in tact. Another fabulous idea (courtesy of Martha Stewart no less) is the idea of folding sheets up in to a pillowcase to keep things neat and organised and sets together. Do you have a great laundry organisation tip that you would love to share? Please drop me a comment below, I would love to hear your thoughts or what works at your home. I am a little bit excited as tomorrow I will be sharing with you a fellow Organisers Laundry cupboard and it looks amazing!! Hi Organising to Make Life Easier, thank you so much for the visit and the kind words. Oh I would love to see how you have used your labels, I am sure that it looks amazing!! Hi Allison! Are they ikea tubs? The large white plastic ones? I would live them for our laundry! Hope that you are well. Yes the tubs are indeed from Ikea but I am unsure about the name. I can try and find out though as another reader was after them too. They really are fabulous - so big!! They also come in a half size as well. Hi there, A new blog reader- found via the Organised Housewife. But love your blog and these labels and baskets. Never thought I'd get into this stuffer- but very inspried! I hope it lasts long enough to do my whole house and then continue with it! I am so glad that you found your way to the blog and managed to find some inspiration too. I really hope that you will enjoy following the blog and best of luck with organising your own home. Happy to answer any questions or give you any ideas if you need any! That is sensational! Baskets and grouping and a great label are so sensible and practical. Awesome idea! Indeed, labeling your things accordingly is very helpful because it is easier to find. Me too Elise, it is so hard to keep sheets neat!! I find that by using the baskets now that everything stays neat and tidy. Thanks so much for your comments and Happy New Year! My laundry is on my to do list! Thanks for the inspiration! I tried sets in pillowcase but my family..well the boys would decide they did't like the sheet l had put with their set and pull out from other pillowcases.ended a bigger mess.. I used to have a neat linen cupboard then an older son had to come home to live and the 5 Shelves l had became 2 the other 3 has boxes of his stuff on them. 5 yrs later its still a mess must get it resorted again..
Hi Mary-Anne, thank you so much for taking the time to comment (and read) on my blog. It really doesn't take much for things to get in to a bit of a mess again does it?! I know that mine could do with a good tidy after neglecting for a few months with a difficult pregnancy. Best of luck with your sort!